Summary: In the early 1940s, a visit from Marie-Claire’s Oncle Gérald brings more than his welcome presence, it brings tuberculosis (TB) to her family. After he is hospitalized and dies in a local sanatorium, Marie-Claire, her brother Luc, and her sister Josée all develop TB, and with their varying degrees of severity find themselves in different parts of the same sanatorium. But while Josée seems to be improving, Luc is getting worse, and Marie-Claire herself is in a holding pattern, waiting for the lesion in her lung to finally heal. As a year passes, Marie-Claire faces life from a hospital bed, learning that though she feels like she has been paused, illness doesn’t stop a person from growing up. Review: If you are a reader who loves action, this book is not for you. If you are squeamish about hospitals, blood, bodily functions and medical procedures, this is also not the book for you. But if you are looking for a genuine and honest portrayal of character growth as a girl becomes a woman in the unlikeliest of places, you will not find a more thoughtful read. There are many things I could write about Queen of Hearts by Martha Brooks, but I will try to be as succinct as Brooks is in 206 pages. First, there’s Signy. Living in a sanatorium since the age of twelve, Signy has spent five years waiting for her TB to heal itself. In the pursuit of wellness, she’s given up parts of her lung, nine ribs, and the belief that anyone could ever love her. In many ways, her maturity level has been paused at twelve, and she is a sympathetic character as her parents rarely visit and she keeps having to say good-bye to her roommates as they get better and she does not. But though she bristles Marie-Claire with her child-like nature in the beginning, Marie-Claire grows from feeling sympathetic toward Signy into empathy. Second, Marie-Claire is understandably angry with God after the deaths of Oncle Gérald and Luc, refusing to see her priest when he comes. She is told to pray, but she is too full of grief to do so. Enter Fred, a chaplain. He’s the best kind of minister for Marie-Claire because he is a human first and a religious leader second. Instead of pushing her to talk about God and confess her sins, he simply sits with her as she is. With his magic trick he even instils a bit of hope where there was none, and Marie-Claire’s conversations with Jack later reveal Fred has had a similar effect on others. He’s a quiet but powerful character in his displays of compassion and humanity. Three, while all of Brooks’ other characters are compelling in their own right, they are all a backdrop for Marie-Claire herself. Brooks has created a character who is easy to care about, and who is equal parts of strength and vulnerability. Thrust into a situation beyond her control, Brooks details how the experience helps Marie-Claire to grow instead of becoming stunted. She faces crippling loss, and is forced to learn patience as every day becomes a waiting game. Marie-Claire’s development is slow-simmering, and Brooks is a masterful cook. I like it because it is realistic, touching, and not sentimental. I love the title, Queen of Hearts, because the reference is used in many ways in the story, but perhaps the title is most apt when thought of as a reference to a card in Fred’s magic trick. As the Queen of Hearts popped up unexpectedly in Marie-Claire’s room, so Brooks’ book pops up unexpectedly as a powerful, character-driven tale among the most benign of settings: a sanatorium. “I shrug again. I have another cold and these days I never feel well. This, more than anything, makes me sorry for myself. What can I tell her? It would only sound like complaining and besides, I’m too proud to complain. “Marius Berand, when we were nine, caught me in the cloakroom one day after recess and kissed me in a slobbery way as he tried to put his hand up my skirt. I drew back and slapped him so hard I left a red mark on his face, and then he stumbled out from one side of the cloakroom and I marched out of the other. ‘Small ones,’ she says with a sob. What can I say to that? She’s right. It won’t. 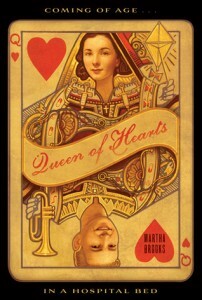 Queen of Hearts by Martha Brooks is published by Groundwood Books, (2010).